Silver Stars Bell Wreath. A modern take on the traditional Christmas wreath, this silver bell wreath would work perfectly as festive wall décor, on your table or add a jingle to your door this Christmas! A set of 3 glass onion shaped Christmas baubles. Christmas decorations for your home this festive season. Vintage style Christmas baubles. Let Santa know you are ready for Christmas. A Nordic themed Christmas decal for your window. This Christmas tree sticker is non adhesive so you just peel it carefully from its sheet and apply to your window. Matt white finish. The classic robin Christmas decoration. This red felted robin is self standing. 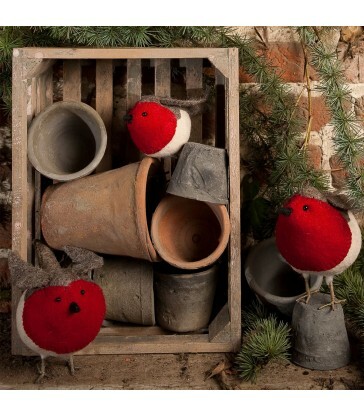 Handmade under Fairtrade guidelines, each robin is hand stitched by an all female team. A beautiful gift to give or receive, and add to your festive decorations every year.